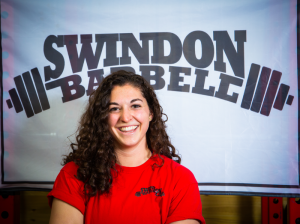 I am a certified British Powerlifting Coach (Level 1) and an assistant coach at Swindon Barbell. I have been coaching since 2015, writing one-on-one programmes, and running a women’s only barbell class in Bristol. I used to throw shot put in High School, and have dabbled in weights since then! I only seriously began strength training in 2013 after injuring my knee during a marathon. Yup – both Classic and Equipped since 2014. I compete internationally for Team GB. At the moment I am the Equipped -72kg British Champion, and hold the silver medal in the All England Bench Press Championships. Last year I was All England Champion and Western European Champion, and placed 3rd at the British Nationals, 8th at the Europeans and 12th at the Worlds in the -84kg weight category. The Fork-Lift. Just kidding, I love all things SQUATS! My Grandmother’s Ragú and Rotelle.